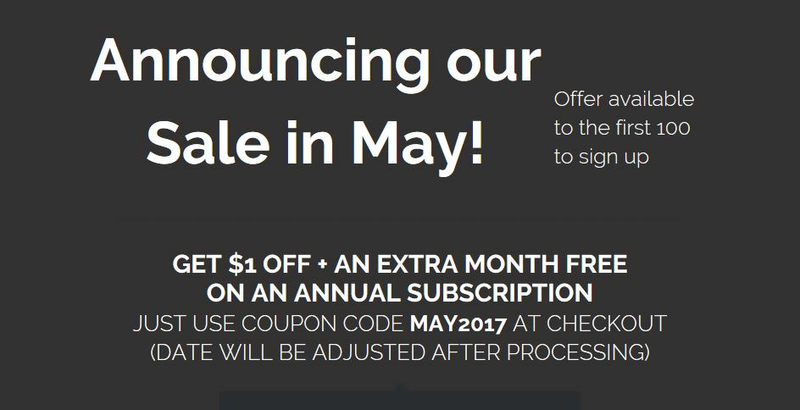 The adage "sell in May and go away" has been well known to traders for many years. 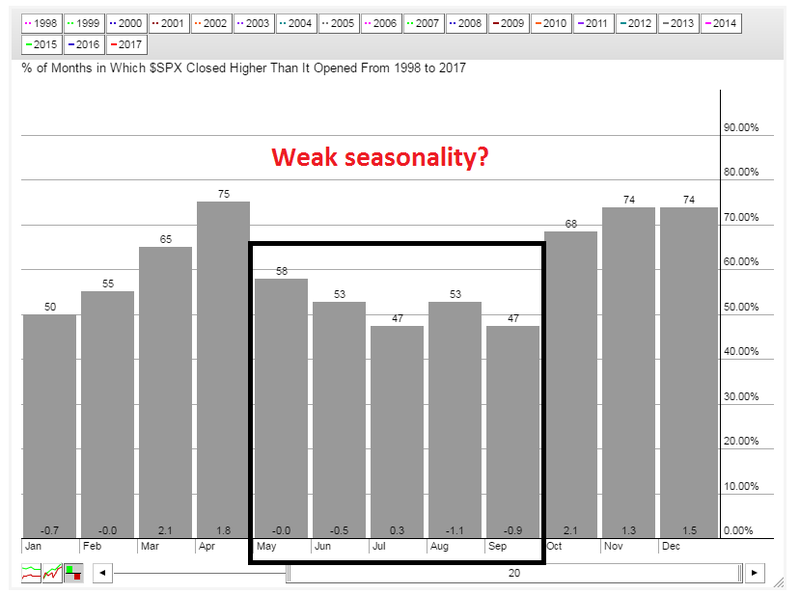 Indeed, the chart below shows that the stock market is entering a period of weak seasonality. 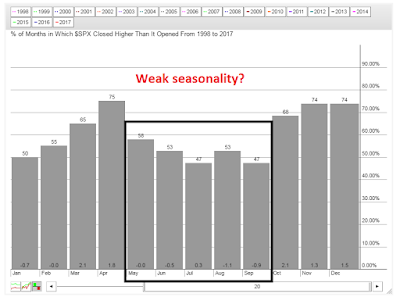 Should investors heed the cautious seasonal signal and avoid stocks? Let's consider the bull and bear cases before making a decision. Just overbought, or a "good overbought" signal? Mid-week market update: In the past two weeks, I have become progressively more bullish on stocks (see A capitulation bottom? and Buy signals everywhere), based on the belief that the risk/reward trade-off was tilted in favor of the bulls. Even as the market bottomed with sentiment at crowded short levels, the rebound had been unusually weak with little bullish follow-through. That pattern was broken this week when the stock market finally put together two consecutive up days. In order for this rebound to turn into an uptrend, the market has to show some positive momentum, with a series of "good overbought" conditions. Such episode tend to be characterized by RSI-5 (top panel) getting overbought and staying overbought, as well as the SPX riding the top of the Bollinger Band (BB). The chart below shows some past examples of bullish impulses in the last two years. Can the market continue upwards, or will it stall as it tests resistance at its all-time highs? Will the market focus on the bullish message of the Trump tax proposals, or news reports indicating that the Trump administration is giving notice that it is getting ready to withdraw from NAFTA? Here is what I am watching. Will the real Q1 GDP please stand up? The US Q1 GDP report is scheduled to be released Friday morning. Current expectations call for a Q/Q growth rate of 1.1%, but there are wide disparities in nowcasts. The Atlanta Fed GDPNow nowcast of Q1 GDP growth has been declining since late February and stands at a meager 0.5%. By contrast, the New York Fed's nowcast has been relatively steady, with an estimate of 2.7%. What's going on? Who is right? The evolution of GDP growth in 2017 will have a large impact on Fed policy. When I first got interested in the stock market (back in the day when we programmed computers with punched cards), I learned the principles of market cycle analysis from a grizzled veteran of technical analysis. Markets are said to move in cycles. Here is how an idealized cycle works. 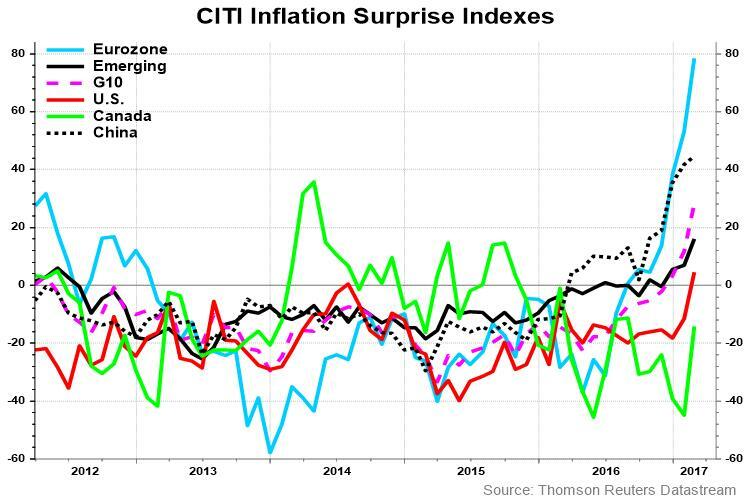 In the initial phase of an expansion, central banks lower rates to boost the economy, and the market leaders are the interest sensitive stocks. As the cycle matures, leadership rotates into consumer stocks, followed by capacity expansion, which leads to capital goods sector leadership. The late phase of the cycle is characterized by tight capacity and rising inflation, which is an environment where asset plays and commodity extraction industries outperform. I never forgot that lesson. I also learned that while the market cycles thematically parallel economic cycles, they are different. Market undergo mini-cycles of changes in sentiment whose length are much shorter than economic cycles. Nevertheless, the broad principles of market cycle analysis remain valid today. 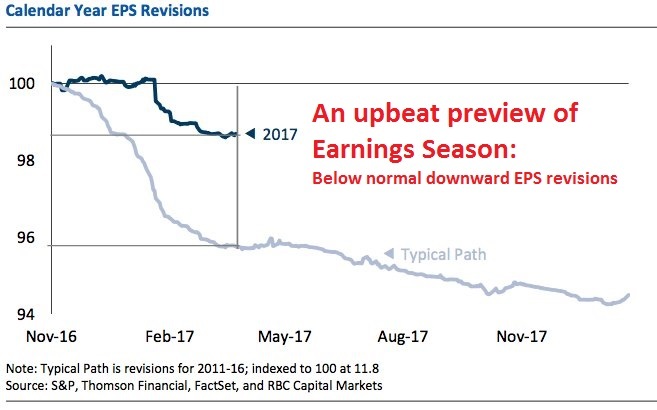 In the past few weeks, I have been repeating the message that the intermediate term equity market outlook appears bullish (see Buy the dip! 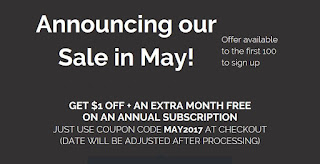 and Buy! The party is still going strongly). There is a growth surge, not only in the US, but around the world. 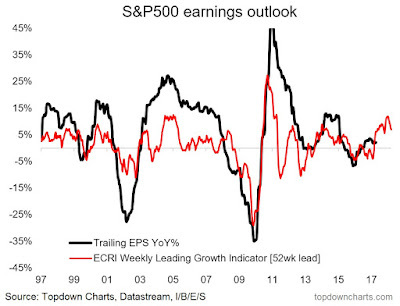 This chart from Callum Thomas of Topdown Charts summarizes the growth outlook perfectly. In addition, the recent 2-3% pullback saw sentiment tank to bearish extremes, which is contrarian bullish. 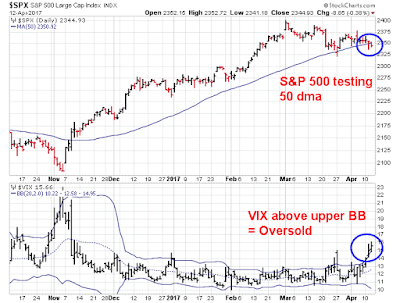 Last week, oversold markets began to bounce, which is an indication of an inflection point (see Buy signals everywhere). As well, Tom McClellan observed that the 10-day Open ARMS index was also signaling a bottom. 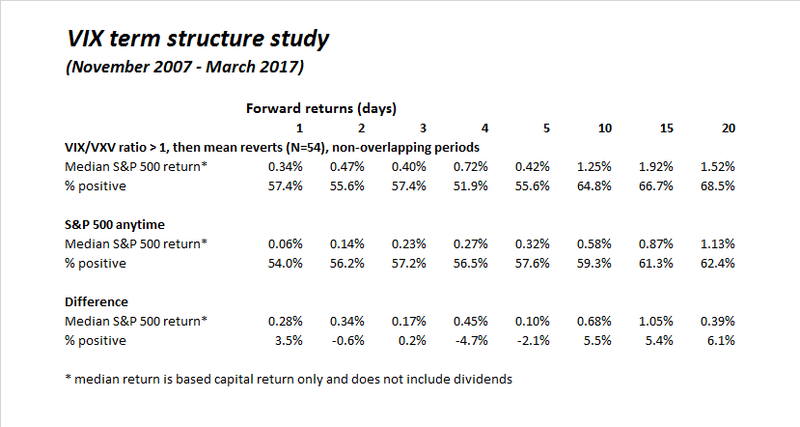 Rather than repeat the same bullish message for another week, I thought that a sector review from a market cycle analytical framework would be a good change of pace. Interestingly, the broad message from this analysis tells the story of a global upturn, and we are roughly only in the third inning of an intermediate term bull phase. Mid-week market update: One of the most reliable trading signals occur when an indicator becomes oversold and mean reverts to neutral (buy signal), or if it gets overbought and mean reverts to neutral (sell signal). 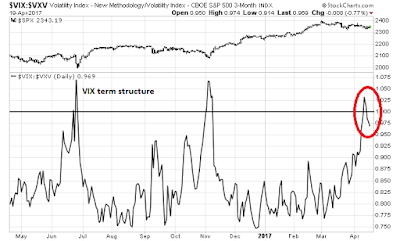 We saw numerous versions of buy signals of that variety from the VIX Index this week. Consider, for example, the VIX/VXV ratio as a measure of the VIX term structure. When this ratio rises above 1, that is an inverted term structure indicating market fear. 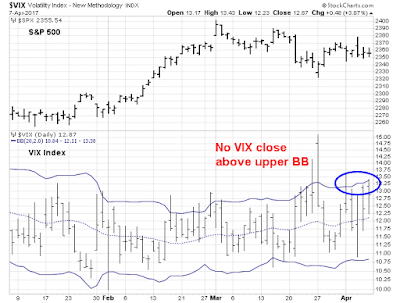 As the chart below shows, the VIX/VXV ratio inverted last week and returned to a normal upward sloping curve on Monday. I went back to November 2007 and studied past instances of this buy signal. Historically, such episodes have resolved themselves bullishly. That's not all! There is more good news from the VIX for the bulls. Can we stop freaking out over the prospect of an imminent war over North Korean nuclear tests? After the hoopla over the North Korean announcement to expect a major event on or before their "Day of the Sun" on April 15, there was much speculation that they would conduct another nuclear test. Trump responded with the assertion that if China wouldn't help, he would deal with North Korea by himself. The aircraft carrier USS Carl Vinson was re-routed from a planned exercise with Australia to the North Pacific. The geopolitical tensions is fizzling out like a wet firecracker. 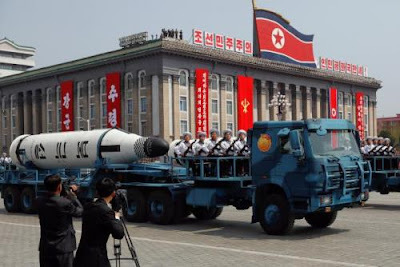 The biggest splash was the display of some submarine launched ballistic missiles that were mounted on trucks in the annual parade. Afterwards, North Korea tried a missile test, but it blew up shortly after launch. Even Zero Hedge sounded disappointed. Japanese analysts believe that the USS Carl Vinson’s change of course is designed to fill a strategic vacuum in US forces at the present moment. “Since the nuclear aircraft carrier USS Ronald Reagan, which is based at Yokosuka Naval Base [in Japan], is inactive from January to April because of inspections and repairs, [the USS Carl Vinson] was deployed to fill a gap [in the West Pacific region],” wrote Tetsuro Kosaka, a staff writer for the Nihon Keizai Shinbun and an expert on Japanese security, in a column for the newspaper on Apr. 11. Though the USS Carl Vinson is in charge of the East Pacific, the fact that it is heading toward the Korean Peninsula (located in the West Pacific) cannot be regarded as an increased American military presence in the region, he argued. In addition, the announcement that VP Mike Pence was to begin on the weekend a 10-day Asian tour with stops in South Korea, Japan, Indonesia, and Australia, it was evident that the US was unlikely to start unilateral military action without consulting regional allies. On Sunday, Donald Trump also tweeted that China was cooperating to defuse the North Korean problem. Preventing Pyongyang from carrying out its sixth nuclear test is the top priority at the moment. North Korea should not think that it has once again broken through the pressure from the global community. If it continues to go its own way, sanctions from the international community will become more stringent and the US will seriously consider launching military strikes against it. If conflict does break out, Pyongyang will suffer the most. As geopolitical risk premiums recede and the South Korean KOSPI rose 0.51% on Monday, it is well worth considering how Donald Trump, who considers himself to be a master dealmaker, can find an accommodation with North Korea. Unfortunately, there aren't any good deals to be found. Consider the options that the current and past American presidents have faced in neutralizing the North Korean nuclear threat. Stock prices have been on a tear since the US election last November. While analysts have attributed the rally to a Trump effect, the chart below shows the SPX and international stocks, as measured by MSCI EAFE, during that period. Both asset classes have performed roughly in line with each other. This indicates the lack of a pronounced Trump effect as the outlook for non-US stocks should not be affected by the prospect of Trump tax cuts and deregulation. 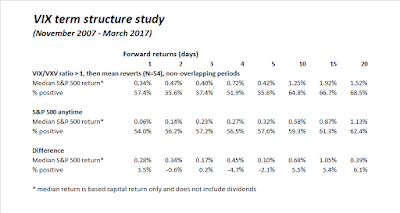 The main reason for equity strength was a broad based global growth recovery. Since taking office, the Trump White House has been seized by legislative paralysis. Consider Exhibit A, the repeal failure of ACA, which was a major goal of candidate Trump. The new administration has struggled to find its footing in the business of governing. The Washington Post reported that, of the 553 positions requiring Senate confirmation, 478 have not even been chosen, such as the three vacant board seats at the Federal Reserve. CNN reported that Trump still has about 2000 vacancies to fill - and that includes the ones that do not require Senate confirmation. To be sure, Trump stated in a recent interview with Fox News that he does not intend to fill "unnecessary" posts in an effort to cut down on government. For now, many parts of the US federal government is running on autopilot. However, with no ambassadors in place in South Korea, China, or Japan, and an unfilled post of the Assistant Secretary of State for East Asia, the recent crisis, or near-crisis, over North Korea highlights the vulnerabilities of a slimmed down government. Still, a government on autopilot makes market analysis an easier task. You just have to focus on the fundamentals. 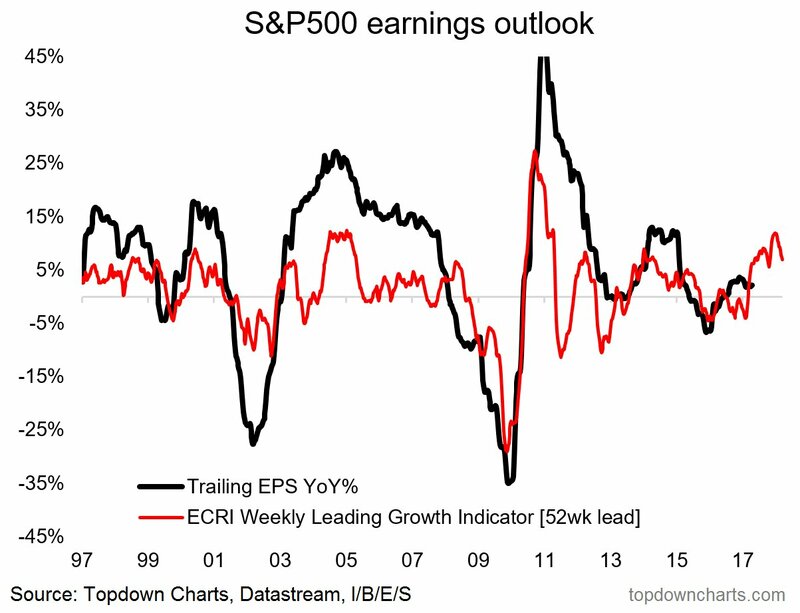 For now, the fundamentals remain positive. Mid-week market update: In my weekend post (see Buy the dip! ), I wrote that despite my tactical bullishness, "traders need to allow for a brief rally, followed by a sharp drop to a washout low before this shallow correction is over". We are finally seeing signs of an oversold market and a short-term capitulation. There were a number of signs of a short-term bottom. On Monday, the VIX Index closed above its upper Bollinger Band (BB), indicating an oversold condition for the market (see Three bottom spotting techniques for traders). As well, the SPX has been testing support located at its 50 day moving average (dma) in the last two days. Sometime you don`t get the perfect signal. I had been watching for signs of an oversold extreme before covering my short positions and buying, but none of my tactical three bottom spotting models had flashed a buy signal yet (see Three bottom spotting techniques for traders). Some got close. 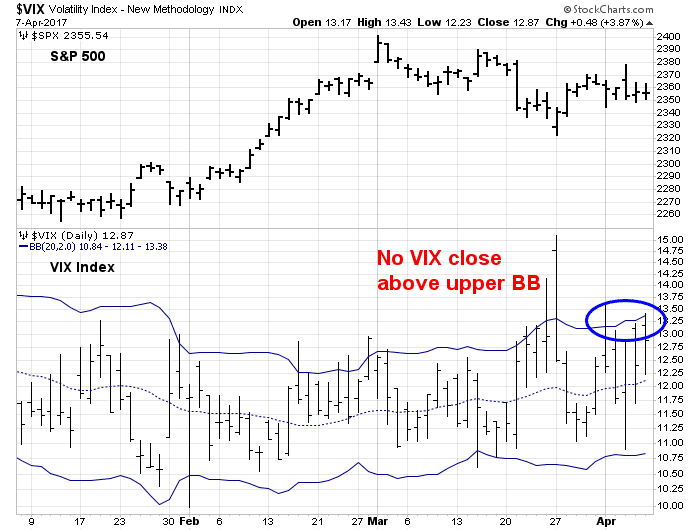 As this chart of the VIX Index shows, the VIX never managed a close above its upper Bollinger Band, but it traded above its upper BB several times. Nevertheless, a combination of macro, fundamental, and sentiment models have turned sufficiently bullish for me to call an end to the current bout of minor stock market weakness. At a minimum, downside risk is likely to be low at current levels. Here in Canada, we are observing the 100 year commemoration of the participation of Canadian troops in the Battle of Vimy Ridge. 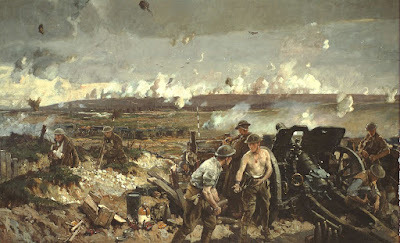 While the Canadian Corp achieved its objectives of capturing the ridge, it was a typical battle of the First World War that left enormous casualties for both sides. After the horrific human carnage of the First and Second World Wars, western Europe formed the European Coal and Steel Community (ECSC), which led to the European Economic Community (EEC). Thus the EU was born. The political intent of the union was to bind France and Germany so tightly together that another major European conflict could not happen again. Despite the setback provided by Brexit, those political intentions have succeeded. 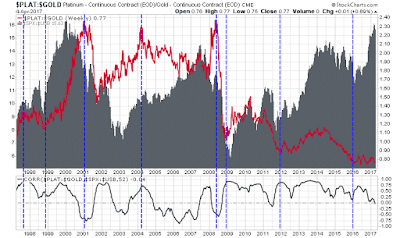 Is the gold/platinum ratio flashing a buy signal for stocks? 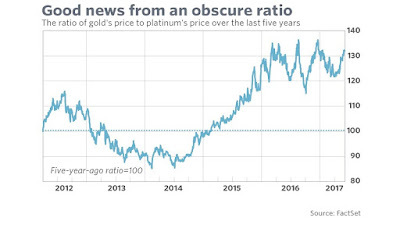 Mark Hulbert recently highlighted an equity buy signal from an obscure indicator, the gold/platinum ratio. The signal is based on a research paper by Darien Huang, an academic at Cornell. The rationale behind the indicator goes something like this. Both gold and platinum are precious metals, which have defensive characteristics during equity bear markets. But platinum has more cyclical characteristics because of its use in the auto industry. 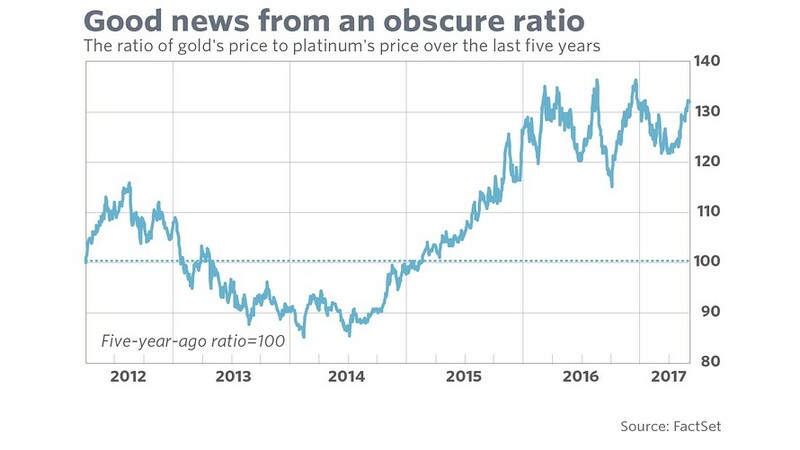 A high gold/platinum ratio (as it is today) is indicative of fear in the market, and therefore stocks should be bought. Conversely, a low platinum/gold ratio signals complacency, which is a sell signal. The way to approach cyclical indicators like these is to decide whether an investor should bet with them (momentum indicator), or against them when readings are extreme (contrarian indicator). The chart below shows the platinum/gold ratio (in red) and stock prices (in grey). The bottom panel shows the rolling one-year correlation between the ratio and stock prices. Based on this chart, I can make a couple of observations. At first glance, this seems to be a reasonably good contrarian indicator at extremes. But given the wide ranges, how can you tell what's an extreme reading? One way to determine whether a contrarian indicator works well at extremes is to look at the correlations of the signals to the market. A good contrarian indicator should see negative correlations to the market at the time of buy or sell signals, or soon after buy and sell signals. An analysis of the lower panel indicates that is not the case. 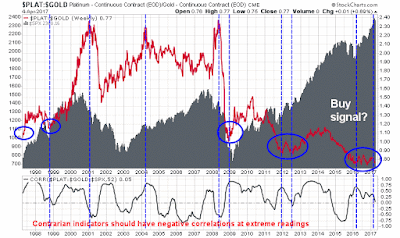 In fact, rolling correlations appear too unstable for this ratio to be an effective market timing indicator. Maybe we are framing the problem incorrectly. Instead of using the SPX to measure the effectiveness of this model, how about using the stock/bond ratio as a measure of risk appetite? 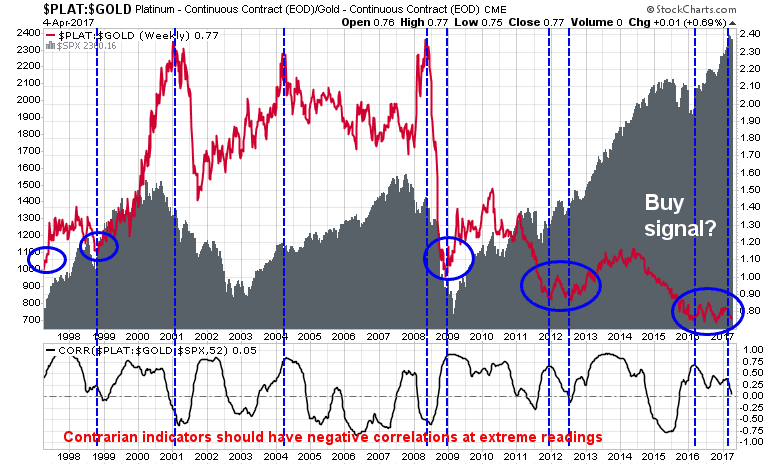 The chart below shows the same indicator overlaid on top of the stock/bond ratio. The correlations shown on the bottom panel are better, but they are still very unstable, and correlations were not negative when or after buy and sell signals. Back to the drawing board? Not quite. There are better ways to measure the real-time strength of the cycle. As Donald Trump prepares to meet Xi Jingping this week, I am reminded of the long-term challenges that face China, namely its growing debt. 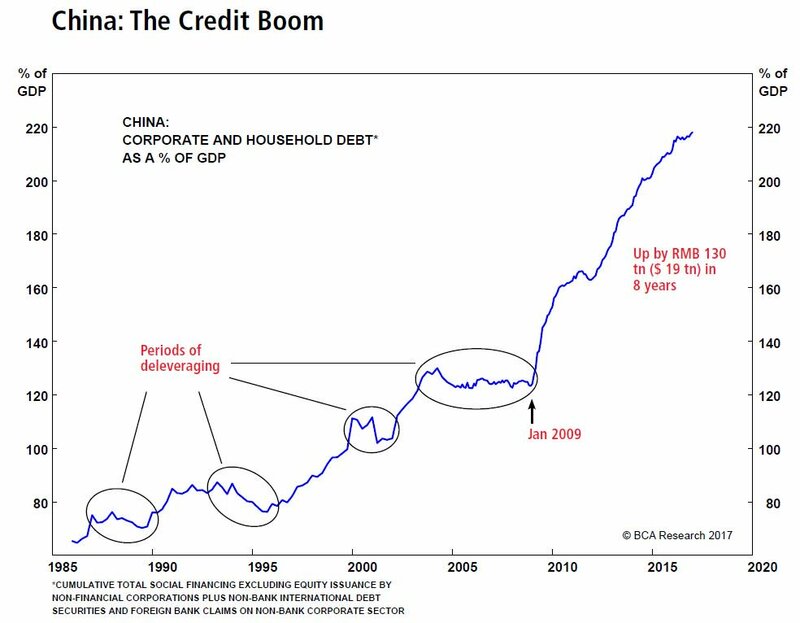 There have been many analysts warning of the credit buildup, here is this chart from BCA Research is one of many examples. 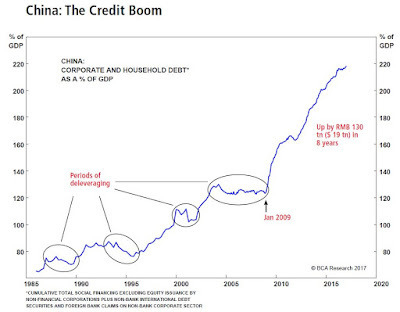 While I am not calling for an imminent crash in China, here is a template of how a collapse might occur. 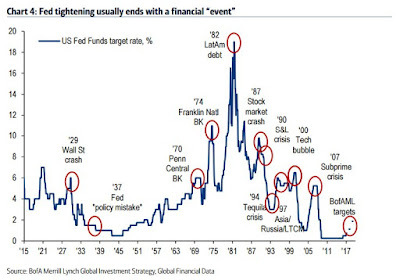 Prepare for Central Bank Armageddon? In the last two weeks, we have seen a parade of Fed speakers reinforcing the view that three rate hikes would be the appropriate policy for 2017. 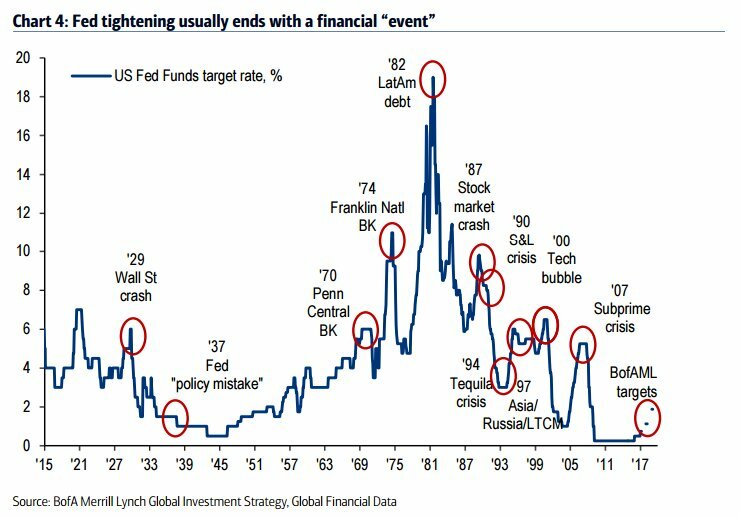 At the same time, I am reminded of this chart indicating that Fed tightening cycles often don't end well because of policy overshoot. 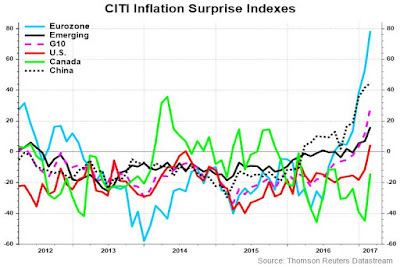 In addition, global inflation surprise indices are spiking, which suggests that a re-synchronization of monetary policy is on the horizon. World central banks are poised to raise interest rates. Is it time to start preparing for Monetary Armageddon? Will central banks overshoot crash the global economy?